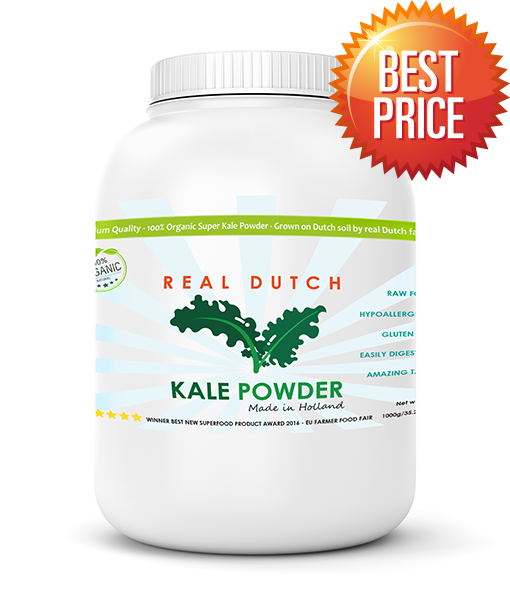 Real Dutch kale Powder is 100% organic and free of additives. Grown on Dutch soil in Holland by real Dutch farmers. That’s what makes us different than the rest! Kale is a Primal dutch vegetable, that has been used in the Dutch kitchen for over 100 years. The Kale gets it’s Super Power when it is grown in a cool climate and mineral rich soil. But the most important factor is frost. Once the soil freezes, the molecules of the plant modify and the Kale starts to produce Super Power! 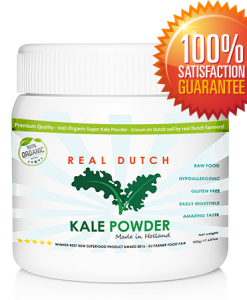 Real Dutch kale Powder is 100% organic and free of additives. After harvesting, the kale is dried and ground to a powder in which the nutrients fully retain their value. Kale naturally contains a very high level of Chlorophyll, vitamins, minerals, protein and fiber that’s what makes this a Real Super food! A delicious and responsible addition to smoothies, shakes, yogurt or juice. 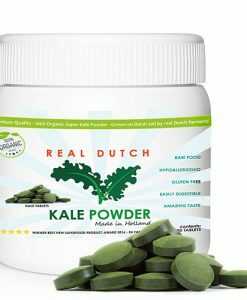 Use Real Dutch Kale Power as a daily supplement for weight loss, boosting your immune system, training for marathons and your daily work out. Content: 1000 gram | 35.2oz. “Real Dutch Kale Power” in the Press (magazines, Online, TV): Womens Health (US), Health Living, Inshape, The Healthy Kitchen, Zen magazine, and coming more soon!